Caroline tells Thomas he doesn&apos;t want him to feel obligated. Thomas tells Caroline he needs his boy nearby. She admits that Douglas wasn&apos;t conceived in love. Brooke tells RJ and Coco she&apos;s heard from Lt. Baker. She informs them they need to pay a fine, but not before she rehashes everything they did wrong. She lectures them on distracted driving by telling them a story of a boyfriend who died in a car accident years before. 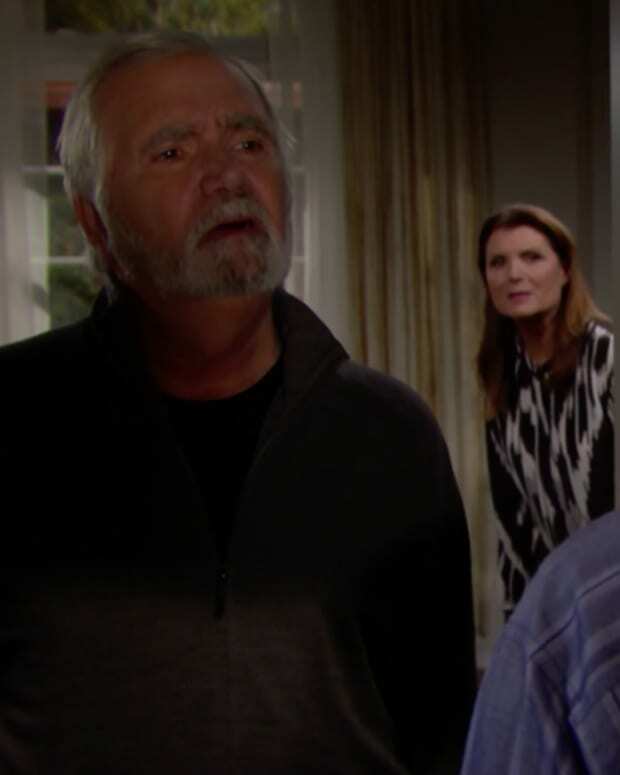 Eric&apos;s not happy that Steffy ratted him out. Ridge tells him he can&apos;t run far enough away because he will always find him. Ridge tells Eric he moved off the property. Eric wonders if Quinn went with him. He says Quinn barely leaves the house and he is there now to say what he has to say. Sally tells Shirley that she&apos;s meeting Thomas at the airport. Grams gives Sally a pep talk about the challenge before sending her off. Thomas wants to know more about Caroline&apos;s disease. Bill tells him it doesn&apos;t even have a name. Caroline gets mad at Bill and tells him to stop. She tells Thomas it&apos;s offensive that he wants to be a family now. Bill mentions that it&apos;s time to leave for the airport, but Thomas wants to stay behind. Caroline tells him he made a commitment and has to go. Ridge tells Eric that everyone is leaving for Monaco. He reminds Eric that Quinn followed him there last year and he fell in love with her. Ridge wants to know why he&apos;s staying in a hotel if he loves Quinn. The Forester crew is on the jet and Sally shows up. Bill tells them she&apos;s invited. Bill&apos;s ears perk up when Steffy informs them that Eric and Ridge are not coming along. Ridge ignores Sheila in the room and tells Eric an honest talk about their relationship. He starts with how he was fired and had to return under Steffy&apos;s command. He wanted to get back at him, but Quinn wasn&apos;t planned. He says Sheila is wary of him, but Quinn wasn&apos;t because Eric didn&apos;t warn her. He tells him Quinn always resisted his advances because she loved Eric. He wanted to take her because he could. Ridge says that Sheila&apos;s presence doesn&apos;t hurt him, but hurts Eric. Ridge tells Eric he tried to beat him and he failed. He advises him to go home to his wife. Eric tells Ridge he called him Marone every time he wanted to hurt him. He apologizes for it and claims that Ridge was always his son. He talks about how Ridge grew up surrounded by love. He relates the moment when he realized Ridge could draw. He talks about their business relationship and how he brought him into the company. Over time, it wasn&apos;t enough. Ridge took all the praise, his mother, and Brooke. Then, he took Quinn away from him, all because he could. Eric takes Ridge&apos;s head in his hands and tells him he loved being his father. He kisses his forehead. He tells him he will never be his son again. Teary-eyed, Ridge leaves the room. Sheila tears up and starts to cry as Eric looks out the window.